I have a confession to make… I hate veggies. Wait, no… that’s a little too drastic. I just hate boring veggies. I’m not one to be seen snacking on a carrot unless it’s loaded with hummus. You’ll never have to worry about me stealing a slice of your cucumber. Wait, is that salt & pepper on your cucumber? I take that back! You can guarantee I’ll never just have vegetable juice. Veggies are made for fruit, right? And you will never, ever, ever in a million years see me eating a salad with oil + vinegar on plain lettuce. Yuck?! 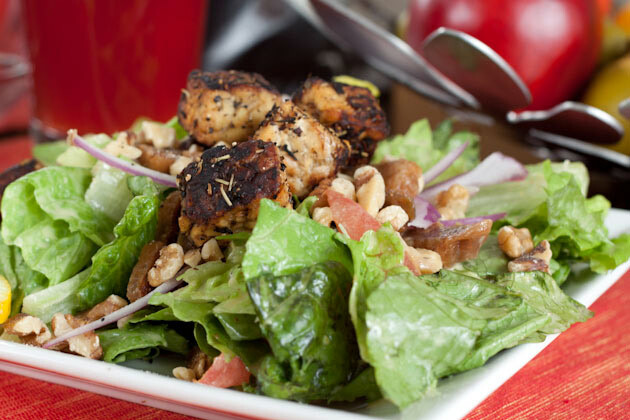 Sneaking off to add some homemade croutons to my salad. Whipping up a batch of ultra creamy and dreamy dressing for dipping + salad use. Topping all sorts of seeds + nuts on lettuce to spice it up. 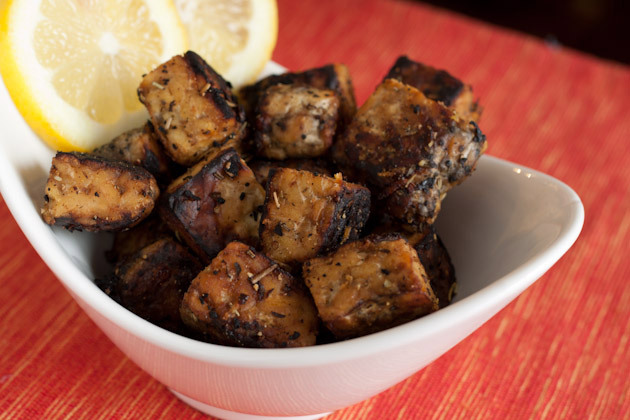 Waiting patiently for 2 hours as my tempeh defrosts just so I can make some tempeh croutons. Yes, veggie eating is a commitment and definitely not a simple task for me. But, when veggies are spiced up juuuust right, they’re delicious and consumed by the truckloads! 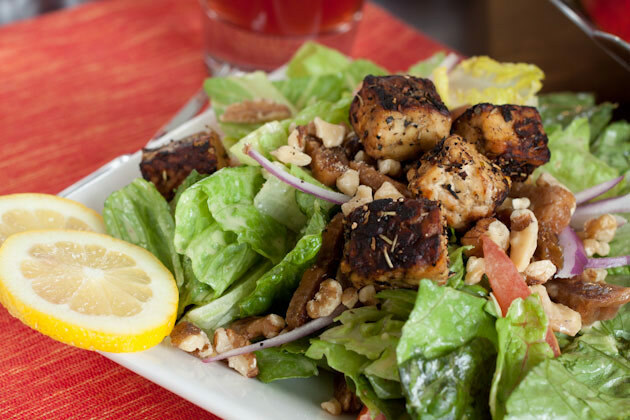 Spice up your salad with some serious tempeh croutons, figs, and sweet lemon sauce. To make dressing: combine all ingredients in a blender and blend until smooth. Set aside. 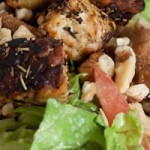 To make croutons: place lemon juice, zest, garlic, apple juice, and spices in a medium sized bowl. Whisk to combine. Add tempeh and stir to coat. Add olive oil to a pan over high heat. Add tempeh and saute for 5-7 minutes. Reduce heat, add vinegar slowly to deglaze the pan. 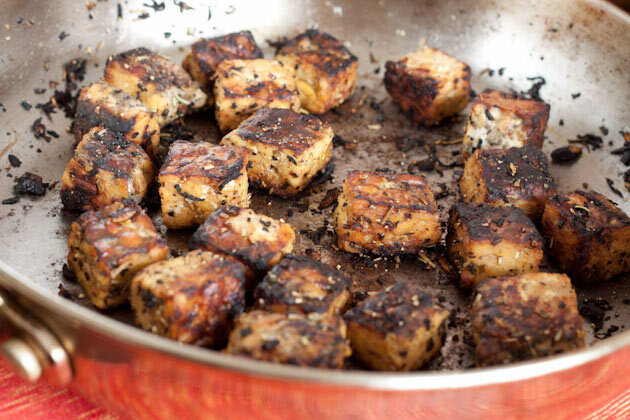 Remove from heat, toss tempeh in a pinch of salt and a few grinds of fresh black pepper and allow to cool. Putting everything together: drop salad ingredients, dressing, and croutons in a large bowl. Toss to coat and serve! mmm now THAT’S how you enjoy your veggies! I just love a good dressing. Don’t you? Something else I totally love? This song?! httpv://www.youtube.com/watch?v=WdO85Qf4Poc Don’t judge me if it’s old. I live a sheltered life. How have I never heard of The Naked and Famous? Officially in LOVE. The way I see it: Healthy dose of awesome music = healthy mind and positive thoughts This song has pumped up my morning in a big way. Rock out with me? What song are you crushing on right now? Can you eat veggies plain? What is your favorite vegetable? Kale [chips]!